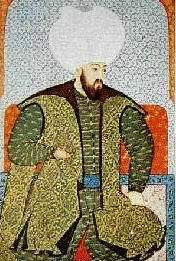 This text is an English translation of the Firman of Bayezid in which the successor of Sultan Murad, who died in the Battle of Kosovo, describes the events of the battle. To you, oh Qadi of Bursa, you who are the most just among the Moslem judges, you who are the most kind among the Nobles, you who are a believer in the one and only God, you who are the fountain of wisdom and goodness, the heir to the Prophet's knowledge, you who are the object of my imperial goodwill, let your good deeds multiply, and also to you, my good Suleiman bay, the Vice Ruler of the Ottoman Empire, you who are the most faithful of those faithful to me, you who arc the flower of the Moslems and the ornament of the holiest Mecca and Medina, I send my blessing. May you spend eternity in honor. By the time this high firman of mine reaches you, let it be known that, after the battle took place, the battle which, as was God's will, took place at the Field of the Blackbird Kosovo, my father, Sultan Murad - whose life was fortunate and who died the death of a martyr, although he, after a dream he had dreamed, to the almighty Allah prayed, to let him die the death of a martyr, alive and without a wound - to his tent which reached the sky, returned. And then, at the time of our greatest pleasure and joy, when we watched the severed heads of the Serbian nobles rolling under the hoofs of our horses, and some of them standing, with their hands tied, and still some others standing with their arms broken, suddenly, one of them by the name of Miloš Kopilić, who had arrived cunningly and under pretext, spoke out and said he wanted to become a soldier of the victorious army. And when, upon his plea, he was allowed to approach our most illustrious emperor in order to kiss his feet, he, instead of doing it, pulled out a poisoned knife which he had been hiding in his sleeve, and directed it fearlessly at the body of the most illustrious emperor, and wounding him seriously, quaffed his thirst with sherbet, the sweet water of martyrs. By now, he has already been accepted among those who the almighty creator for his martyrs, prophets, the faithful and immaculate ones had decreed. His soul, like a bird, is flying now over the fields planted with rose flowers. (Let God pour mercy upon him!) After the said Miloš had carried out this deed, he tried to escape the soldiers who shone like the stars in the sky, but they caught him and cut him to pieces. Upon hearing of these events, I repaired toward the bed of the martyr, but only to find him - the emperor - dead; and at about the same time, it came to pass that my brother, Jacub bay, too, passed away into eternity. - I am dispatching the light emitting coffin with the body of my father with some trusting men so it could be buried over there. So then, when the body has reached there, you will bury it, without giving explanations of these events, but offering to his body, in front of all people, all the signs befitting a victorious leader, so as not to give our enemies any opportunity to suspect anything. All this is for you to know and in this my holy sign to believe.